With a Festiva Resorts French Orleans timeshare, you’re guaranteed all the amenities and accommodations for an authentic New Orleans experience. 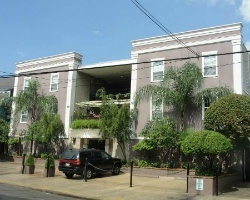 SellMyTimeshareNow.com can get you one of these exclusive spots in the French Quarter at up to 70% off what the developer is asking for! What’s My Frenchmen Orleans 519 Timeshare Worth? Simply put, Frenchmen Orleans at 519 harnesses all that is identifiable with New Orleans. With the architecture, music, food, and custom traditions that surrounds the resort—located right in the heart of the French Quarter—you’ll truly get the experience of one of America’s most famous towns. If you’re down here for the music, the streets are full of local musicians preparing tunes or you can hit some of the popular jazz clubs like The Jazz Playhouse and Fritz’s European Jazz Club for a more sophisticated night out. With the Superdome close by, you can enjoy a nice game of football in the colder months or you can have a date with Lady Luck at Harrah’s Casino. New Orleans truly lives up its reputation as the “Southern City That Never Sleeps". 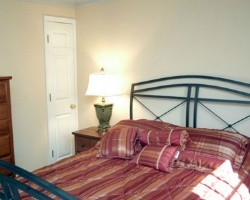 The Frenchmen Orleans is within walking distance of it all! Unwind with the luxuries of Frenchmen Orleans. Take in the resort’s beautiful private courtyard, go for a dip in the resort’s lovely pool, or kick back in the outdoor hot tub. 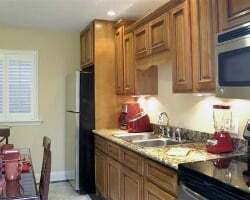 Have a few drinks and watch the energy from your own private balcony/patio or escape the madness and prepare your own cajun style dishes with the fully equipped kitchen. 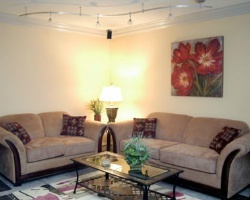 Frenchmen Orleans at 519 has all the ingredients for the recipe of a memorable New Orleans vacation! So get started planning your Frenchmen New Orleans vacation today! Call 1-877-815-4227 or fill out the form on the right for more information. Ownership of a Frenchmen New Orleans timeshare comes in the form of fixed or floating weeks which are available for use biennially. You can use weeks in any season of your choosing. Interested owners also have the option of purchasing points, which could allow for more flexible booking options if you’re interested in something other than vacationing for a full week at a time. Regardless of the type of ownership you choose, you won’t find a better value on Frenchmen Orleans timeshare resales and rentals anywhere else. When you purchase your timeshare through the secondary market, you’re buying the property directly from the owner at a fair estimated value based on the current trends of the resale market. There are no hidden fees! Purchasing a Frenchmen Orleans 519 timeshare means that you receive all the special perks awarded to Festiva Resorts owners. Festiva is one of the newest, and therefore most exciting, brands in the vacation ownership industry, offering many perks and exciting club options for its members including the Festiva Adventure Club. Owners can access the brand’s internal timeshare program, RTX travel, which allows Festiva owners to submit their timeshare weeks or points into the exchange program in order to access other Festiva resorts around North America and the Caribbean for special one-off vacations! Festiva has some amazing properties in fantastic locations all around the country, but if you’re looking to travel internationally in the future, there are ways to do so while still maintaining your ownership. Purchase a membership at RCI, Festiva’s external exchange company affiliated and the largest in the industry. With over 7,000 resorts in its catalog, RCI can provide you with some additional vacation options that Festiva might not have within their network. Simply submit your timeshare week or points into the exchange pool and you’ll have a plethora of vacation ownership options to choose from. At the Frenchmen Orleans, live music is everywhere you turn. Fix yourself up a drink and hang out on your own private balcony and watch live entertainment all night long! Frenchmen Street is always a bustle with activity; top quality jazz bars are everywhere on Frenchmen Street. But don’t let the noise deter you. While Frenchmen Orleans at 519 is right in the middle of all the action, the rooms are a lot quieter than you think. Enjoy spacious rooms, a lovely whirlpool bathtub to soak in after a long day, and a friendly service staff who will always be there for you if you need something. Come morning time when the music has finally died down a bit, venture out to some amazing restaurants for that desired brunch you’ve been craving. Restaurants like the Three Muses, Adolfo’s and The Maison are highly acclaimed in the area, and most of the restaurants feature live music as well. If you’re looking for a vacation that’s always on a high note, Frenchmen Orleans is your destination! Already Own at Frenchmen Orleans 519?